With projects potentially lasting from weeks to years, and with competition so high its vital to keep a track of all the costings of any project and the associated costings. 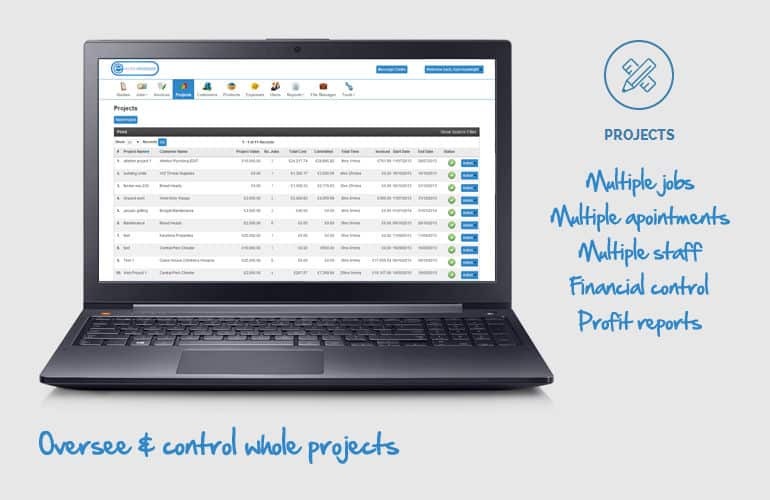 With Eworks Manager's Project Planning Software we help you manage the costs from the start through to completion, allowing you to track your profit and margin levels from the start. Once you have created a project in our system, you can start to add all your jobs to all the different trades, simply assign the job to the project, as you add the products to the job, the project costings start to add up. Once a job is completed you can invoice as a project which allows you to group multiple invoices onto one invoice or you can invoice as you go. As your projects start to build, you can always take a look at the overview which will give you a breakdown of products used, any purchase orders associated to the project, labour costs occurred during the appointments and any expenses. This allows you to really break down the costings from day one; really keeping a handle on the costings. With our digital documents, we can digitise any forms that need to be completed on site, the common form used with our Project Planning Software is a risk assessment form. Once the job is completed the digital forms are filed against the job and project and if you are in an industry that is heavily audited for health and safety all of these forms can be found in our file manager, no need to go search for files and chasing missing paperwork from your field workers.